Rochdale appears at first glance like many other former mill towns in the north west of England. Rows of terraced houses greet drivers as they leave the open plains of the Lancashire countryside and enter the suburbs. Then there’s the ring roads which get clogged up in rush hour. And in the town itself, its vast post war shopping malls and multi-storey car parks that dominate. While the centre of Rochdale may not today seem the glitziest of places, it is certainly an improvement on the past. When the town was an industrial powerhouse, many workers lived in terrible slums. Modern development has largely seen these homes and other amenities demolished and replaced by shops and offices. But despite the change, there is still some continuity with the past. Behind the Exchange shopping centre there is a store, now a museum, where 170 years ago the co-operative movement that we know today was born. There had been attempts at cooperation to provide quality products at affordable prices since the late 1700s, but it wasn’t until the Rochdale Equitable Pioneers Society set up their shop in 1844 that a group managed to build a successful, long-lasting operation. Such ventures usually ran into problems from giving credit and lack of business experience. The Rochdale Pioneers learned from the mistakes of others and developed a model that others travelled far and wide to learn from. It wasn’t easy at first for the group of 28 weavers. They each contributed 2d or 3d a week (and the Weavers Association also provided a loan), but finding premises and getting stock was difficult as existing business owners were wary about them coming in and stealing their trade, while others thought they would fail. Eventually they managed to rent a former woollen house at 31 Toad Lane from a Dr Dunlop. They had go to Manchester market to get stock because locals wouldn’t supply to them. 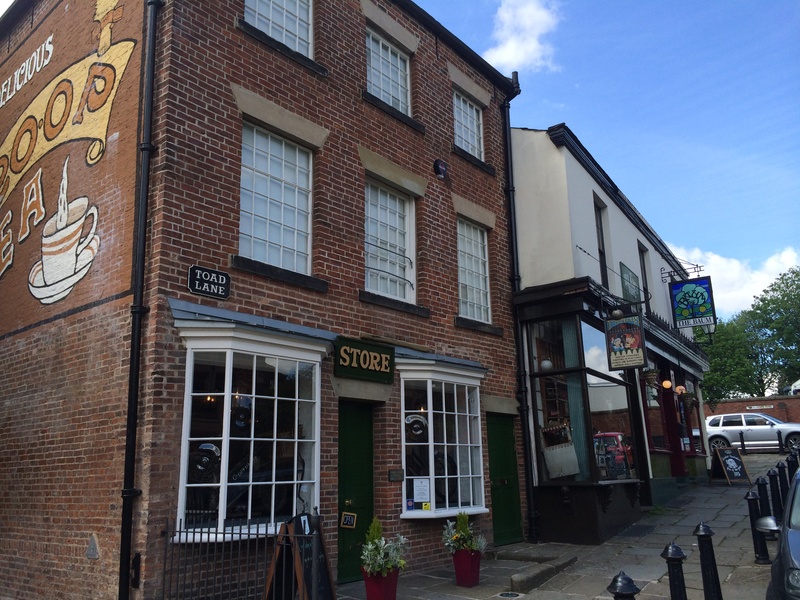 That original shop is now preserved as part of the Rochdale Pioneers Museum, which has an exhibition telling the story of how the co-operative movement grew from a dedicated group of textile workers who were fed-up with being ripped off with poor quality, expensive food. The 1840s was a difficult time for the lower classes, with high unemployment and rising prices, so the Pioneers were welcomed. To keep costs down, they had very limited shop furniture – food was sold from barrels and planks were used as a counter. 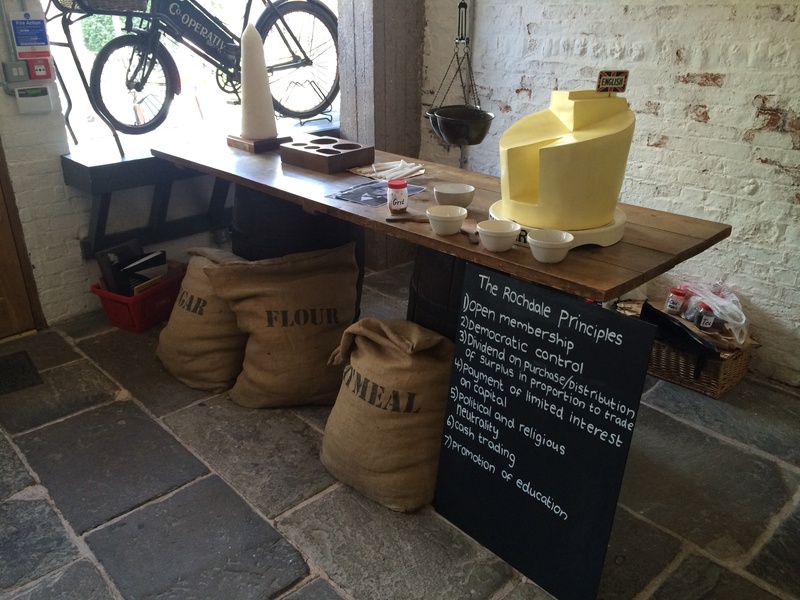 This set-up has been mocked up today in its original location for visitors to see. Established under a set of principles inspired by the socialist Robert Owen, the Rochdale society’s aim was to raise the quality standards of food sold. Everyone who was a member of the Rochdale society was given one vote at an Annual General Meeting. Profits were distributed not on the basis of how much they each invested, but by the amount spent in stores (it became known as the infamous ‘divi’). The movement quickly grew. 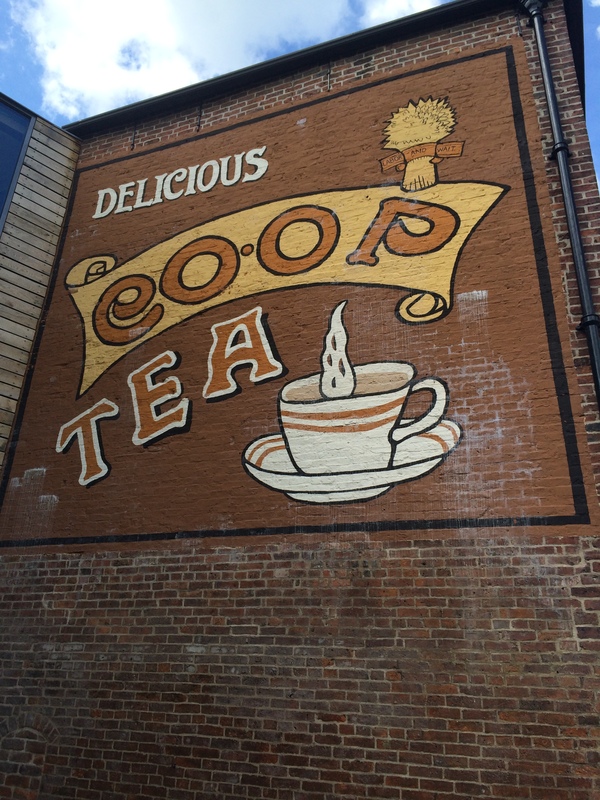 By the early 1900s there were 1,651 co-operative societies in existence and by the 1960s most towns had at least one. In time organisations didn’t just sell food, but became department stores selling everything from linen to jewellery. Given that co-operative societies also moved into everything from providing affordable housing and education to travel agencies and organising funerals, it became a true cradle to grave operation. But over time following major mergers and acquisitions what grew into the Co-operative Group started to change. In recent years the group forgot about its socialist foundations and became as (if not more) greedy as the Victorian businesses the Rochdale Pioneers had set out to challenge. The biggest mistakes, of course, were made in its financial services division where management joined in the speculation of the banking boom and ill-fatedly bought the heavily-indebted Britannia Building Society. Integration problems following the purchase of supermarket chain Somerfield hasn’t help the group either. The question now for the Co-operative Group is where to go from here. Has the organisation changed too much to be able to achieve a return to the socialist ideals of the past? Even Labour party leader Ed Miliband, with all the problems that he has, clearly believes that being associated with the Co-operative brand is toxic and is taking its funds out of the Co-op Bank. It’s important however to make a distinction between the Co-operative Group as an organisation and the co-operative ideals advocated by the Rochdale Pioneers 160 years ago. Even if the former has gone too far to achieve its original aims of serving the most vulnerable members of society, I still believe there will be a role for consumer-controlled, co-operative societies for some years to come. For those that argue that capitalism is failing, these organisations can offer a viable alternative. It’s time to go back to the story of the Rochdale Pioneers to see how local people can truly benefit for a co-operative society.